Earlier this month, my wife and I had the opportunity to go to the temple and get our endowments and sealed together…on the same day! It was quite and experience and I tried to prepare by taking the whole prior week off to not worry about work and to read the Book of Mormon and spend time with my family. After all, I was thinking, that I will be able to spend time and all eternity with my children, who are gifts from Heavenly Father, to raise, love and teach the gospel to. It was like a first wedding for ourselves as well. When we were younger, we tied the knot in a drive through wedding chapel in Las Vegas! We had people from our ward there, the Brother and Sister who were there as Ward Missionary Leaders to host us and have the Missionaries teach us the discussions. Our Bishop, who I admire greatly for his example he sets and his hard work and love he pours upon the people of his Ward. Our friends that we’ve made in the 21 months we’ve been going to Church. Our friends that I have from work, who are coincidentally members of the church as well and instrumental to our growth in the Gospel of Jesus Christ. The day was perfect for us. It was gloomy and rainy in Las Vegas, just how we’d hope our wedding day would have been. We met my friends, Joey and Sabrina, and Mike and Crystal. I felt guided the whole time I was in the temple, by the brethren who are there to make me feel welcomed and help me learn. There was a lot to take in and we definitely need to go back many, many more times to figure things out. Because we were doing our endowments and sealing the same day, we were whisked away to the Sealing room to be married forever just as soon as we made it to the Celestial room of the Temple. It was a great feeling to be in the House of the Lord among friends, whom I consider family. I urge those who have not yet made it to the temple to go as soon as you can. There are blessings to be had by attending. Since my last post, I’ve been doing great! I feel that I have been blessed with a wonder wife, precious children and great friends. About two weeks ago while thinking I was going to work through the night, I had the impression to call my wife up and ask her to go get our temple recommends. We showed up unannounced at our church thinking it was going to take 15 minutes like I’ve also heard in Priesthood it would take. It looks like if it’s your first time for a temple recommend the Bishop would take extra time to talk and meet with you about it. We found that out as I waited for my wife for about 45 minutes with my kids. We also had delayed a Bishopric meeting that they were going to have, but the brethren didn’t seem to mind too much as they were hanging out and having a good time. After my wife came out of his office, it was my turn and it took about 20 minutes or so as he talked to me. We have our temple recommends signed by ourselves and our Bishop and we now only need to meet with our Stake President. Our Bishop also wanted to meet with us again to talk about things with us as a couple that Sunday. That Sunday evening we met with our Bishop and talked about some wonderful things. Afterwards, I called on Sunday to make an appointment with the Stake President but never heard back from the Stake Secretary. That Monday morning I spoke with my boss about getting a week off since I have been working non stop, six days a week, since the beginning of the year…and “I was going to get remarried to my wife…sealed in the Temple.” I wanted to spend time with my children, to study the scriptures and ponder things and concentrate on spiritual things. My wife called on Wednesday to see if we could get a hold of him. He told her that he would call her back on Friday so we could meet with the Stake President on Saturday. Friday came and gone without a call. Saturday came and I anxiously awaited until about 10am. I then called him and left a message. I never heard back from him until about 6pm. I was worried the whole day thinking he had forgotten about us and that we wouldn’t be able to go and get our Endowments and Sealing next Saturday. And that I’d have a whole week of time off of work to feel disappointed. Since he finally called back, tomorrow morning at 9am we have an appointment with our Stake President and I am excited that we are a step closer to things. I am glad that I am writing this post, because it just occurred to me that it would be a good idea to bring our recommends in for him to sign! I am greatful for the blessings in my life. Is it weird that I am not saddened? 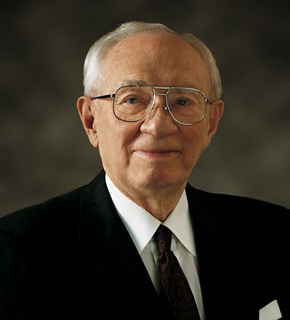 The President of the Church of Jesus Christ of Latter-day Saints, Gordon B. Hinckley has died at the age of 97. Being less than a year into this, I can’t say that I’m too affected by it. I have only really heard him speak once during the Semi-Annual General Conference. I enjoyed what he had to say in October and was looking forward to him this April. I realize the progress this Prophet made for the church during his presidency and admire his works. The world went from 56 to 224 temples? Amazing! So is it weird that I am not saddened by his passing? No. I am happy for him! Happy because of the plan of Salvation. I found out last night when my friend Mike gave me a call. I said a prayer for his family to have peace and comfort. I wasn’t saddened really, just a little surprised. I thought he was kidding around when he said he was hoping to make it to April’s General Conference. For the gate by which ye should enter is repentance and baptism by water; and then cometh a remission of your sins by fire and by the Holy Ghost (2 Nephi 31:17). Confirmation is done by someone with the Melchizedek Priesthood Authority, under the direction of the bishopric or branch presidency. One or more Melchizedek Priesthood holders participate in this ordinance. The Priesthood holders encircle you while you sit down in a chair facing the congregation. They place their hands lightly on the person’s head. Calls you by your full name. Confirms you a member of The Church of Jesus Christ of Latter-day Saints. Congratulations, you are now a member of The Church of Jesus Christ of Latter-day Saints. I was a little disappointed on Sunday as I sat out in the lobby during Sacrament. I sat there with my family and waited with others as the bread was blessed. Afterwards, I expected a Deacon to come out the Church doors to pass Sacrament to us. Usually when I am waiting for Sacrament, I have a feeling of peace and relief. It turned to horror as they began to bless the water. They forgot us! My family and three others. Even worse, a Deacon finally came out with the water tray. Everyone just took the water, except one or two people the Deacon missed again. I am just disappointed. It seemed that no one wanted to say anything for the sake of reverence. For the rest of the hour I was sad and disappointed…and little angry that I things were overlooked. When I was passing sacrament over a month ago, I was taught how important the Sacrament Ordinance is and how we should make sure everyone has a chance take it and to be mindful and observant. I wasn’t sure what to do, to let the Bishop know we were missed or to seek out the President of the Deacons or the President of the Priests? To the readers – what are your opinions on this? When the Deacon came around with the water tray, we took from him. My wife asked me “Does it still count?” My answer. “Yes.” But I am really not sure – I know that Sacrament is supposed to be done a certain way and we did not partake of the bread, but our intentions in being there would have to be enough. I finally found peace when a thought came to my mind – I can wait until next week. It will actually be three weeks without Sacrament since there was a Stake Conference last Sunday. It will be a very, very long week. On another note, since I have children my wife is very helpful for tending to them during Sacrament meeting, sometimes I am guilty of letting her bear the entire burden of them. I don’t know what I would do without her, she makes things run much easier in the family. I feel I need to do better in helping and taking turns with the kids so she can get more out of Church. Maybe I am a little selfish, but I look forward to the three hours on Sunday and try to learn as much as I can in that time period. The talks today were on repentance and I tried my best to listen to it. I couldn’t hear half the time. There were about six children in the lobby, not including my three, and some other members and the place sounded like a cafeteria with all the screaming, singing and chattering going on. The single speaker in the lobby ceiling was easily overpowered. I was annoyed at this. I try to keep it mellow when I have my kids in the lobby, if the baby starts to act up, I will actually leave the building until he calms down – as to not disturb anyone else in the lobby. It seemed no one was going to do this today. A few months ago the Bishop talked to us about reverence and the importance of it and even more I now realize the magnitude of it. We should stay respectful of the people at Church. Sometimes people need Church more than others. At times I feel like I need Church more than another week. This time I felt I needed it more than ever. I needed time for self-reflection, learning, comfort and peace. The first hour made me feel like I was robbed from it between having half a sacrament and missing the talks. I realize people aren’t perfect and things go wrong sometimes and forgiveness is all I can do. I did forget first hour and enjoy the second and third. I am looking forward to next week to start anew: renew that covenant, listen to those talks and avoid the lobby if I can help it. Sunday was Stake Conference. We got to sleep in an extra hour because it started at noon. The entire building was full and we ending up sitting in the back. Shortly after the first hymn and the invocation they began to read the names of members who were to receive the Melchizedek Priesthood. My name was read from the short list and I felt exceedingly great joy as I stood there and was sustained by the entire Stake. It has been a whirlwind: receiving the Aaronic Priesthood and learning, serving and growing in that capacity and now being able to be a Melchizedek Priesthood holder. And now more than ever, I will strive to be humble and obedient. As a husband and father, I understand the many responsibilities and blessings that come with the Melchizedek Priesthood: the ability to greater serve my family and others with blessings for direction, healing and comfort. Though he may not know it, a home teacher of mine set a great example in my early membership as I asked him on the spot to offer a blessing for my children. I watched him bless my children for the coming school year. I am glad to be able to be able to do as he once did. And once again I have put my friends on the spot in asking them to confer the Melchizedek Priesthood by the laying on of hands. I also see the importance of remaining worthy-as my home teacher was able to exercise his priesthood at a moments notice and as my friends are able to confer the Melchizedek Priesthood in such short notice as well. This weekend was an amazingly spiritual one. Having the Aaronic Priesthood, I was blessed to participate in the sacrament ordinance and perform the blessing of the bread. What is said during baptism, blessing of bread, blessing of water are the only three ordinances that must be said word for word in the church. Anticipating this day, I have been studying the sacrament bread blessing prayer and sacrament water blessing prayer for over two months and had it down to a science. Of course when I was driving to church and walking down the hall to the Bishop’s office for a quick meeting, I ACTUALLY FORGOT THE WORDS! “It figures” I thought. However, having faith that I would be able to perform this ordinance by the grace of Heavenly Father, I did not fear. Before discussing what is done for the blessing of the bread with the Bishop, we knelt down and he said a wonderful prayer: That I may be able to officiate successfully, have clear thought and speak clearly and precisely. This eased my tensions further. After the meeting, I must’ve drank from the water fountain at least ten times, trying to thwart off a dry mouth. When my mouth is dry, my speech suffers. It didn’t work. I had a card that the ward mission leader gave me when I was conferred to the Aaronic Priesthood. It was titled “Suggestions for ordinance work” and it had the list of blessings and prayers in it. I read off the bread prayer over and over. It made me feel a little bit better. Sitting up in the stand during sacrament meeting was going fine. The church was unusually crowded that day. The entire church was filled. So much that I could not see my family anywhere; they were in the lobby. “More people to witness me messing up and saying the prayer twice” I thought. And then I found out why it was so crowded-there was a baby being blessed and there were a lot of people in town visiting. When the Bishop asked that the people participating in the blessing to come forward, two full middle rows stood up! It was revealed to me later that day that 320 people attended sacrament meeting. The second hymn started and my heart started to beat faster. Nervousness set in. We all stood up in unison. We approached the table and uncovered the bread. I began breaking the bread…I got the end piece again! Those things are harder to break apart. While breaking the bread, I had the epiphany to make it the pieces slightly smaller so we could have enough for the entire congregation and so I would not have to prepare and bless the bread TWICE. I successfully got two trays done, the other three priest handled the rest. I finished first and stood there reverently. The other priest continued breaking the bread until they were done. The hymn was finished and the sister playing the organ concluded the song. Panic set in! Having been on the end of the line and wanting to avoid running into the priest next to me, I carefully moved back until I was clear and then proceeded forward and to the middle of the line. They raised the cloth up and held it for me. I proceeded to kneel down on my left knee and slide out the microphone tray. The little light turned red-the mic was hot! “Here we go, you’ll do fine.” I said to myself. Now the microphone tray has a tiny microphone in it and has the bread prayer and water prayer so you can read it while speaking. In my opinion, it wasn’t designed very well. Having to put your mouth right at the microphone, you cannot really read the prayer very well. The words are too close. It was a miracle! I made it through and I think I didn’t mess up. I looked to my right at the Bishop for approval that I said it correctly. He nodded his head “yes.” I had made it. I was even more relieved when I found out there was enough bread and the Teachers and Deacons began their way back to the sacrament table. Later that afternoon, I was interviewed by my Bishop for receiving the Melchizedek Priesthood. It was an amazing Sabbath Day.